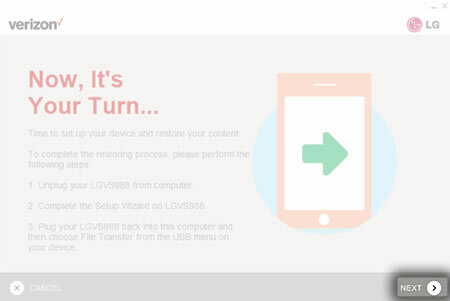 This helps you repair the software on your LG device using your computer. Asegúrate de que el dispositivo móvil esté encendido, desbloqueado (si el dispositivo tiene activado el bloqueo), luego conéctalo a una computadora compatible usando el cable USB provisto. In some instances, the device must be in boot mode to complete the repair process. The SUA provides instructions to enable boot mode when required. El proceso de reparación puede demorar hasta 30-90 minutos. Se recomienda hacer una copia de seguridad de los datos del dispositivo a reparar como precaución. No desconectes el dispositivo de la computadora durante el proceso de reparación. Asegúrate de que el Software Upgrade Assistant (SUA) esté instalado. Ingresa a Configuración inicial - Software Upgrade Assistant para obtener ayuda. 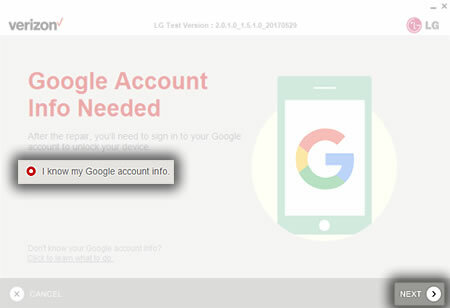 If the software doesn't download from your device after plugging into your computer, download from LG's website (enter your device model name into the box and choose your specific Verizon device model and click Search). After entering your device model, click on the Instructions link. If presented, click on the 'Software Instructions' or 'How to Update' link (located on the left-side of the page). Click the Software Update Tool link. Choose your Operating system and connect your device to the computer. Select 'Run' to load the software directly to the device or tap 'Save' to download the software update to your computer for a later installation. From the desktop, click the VZW Software Upgrade Assistant icon located in the task bar (next to the date and time). If not available on a Windows computer, navigate: Start > All Programs > Verizon > Verizon Wireless Software Upgrade Assistant. 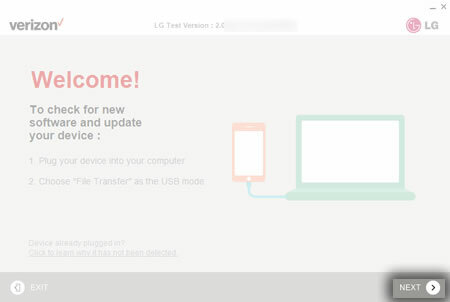 Ensure the LG device is powered on, connect it to the computer using the USB cable, choose File Transfer as the USB mode, then click NEXT. If the software is up to date, the Repair Assistant automatically launches a check for repair software. Click Start Repair to begin. If a repair is necessary, it can take from 30-60 minutes to complete. Do not disconnect phone during this process. Some images may vary depending upon device and operating system. 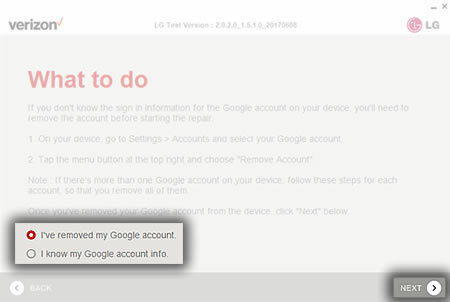 After the repair, you need to sign in to your Google account to unlock your device. Click the "I know my Google account info" option, click NEXT and skip to step 7. If you do not know your Google account sign in info, follow the instructions and remove the account then check the appropriate option and click NEXT. At this point, the data is backed up, the Repair software downloads and the repair begins. The amount of time required to back up your content depends on the amount of content to be backed up. Downloading the Repair software can take from 30-60 minutes and the repair can take from 30-60 minutes. Leave phone plugged into computer during this time. 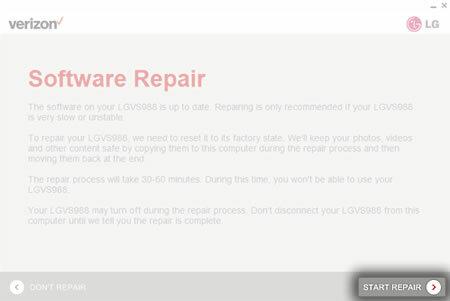 Once the repair process is complete, follow the on-screen instructions then click NEXT. At this point, the data restore takes place. It can take from 30-120 minutes. After the restore has completed, click EXIT.